1. a lessening or diminishing. 2. the correction of a fracture, dislocation, or hernia. 3. the addition of hydrogen to a substance, or more generally, the gain of electrons; the opposite of oxidation. Reduction of a fractured bone. 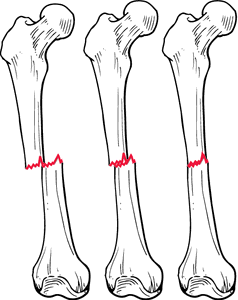 A gradual pull is exerted on the distal (lower) fragment of the bone until it is in alignment with the proximal fragment. anxiety reduction in the nursing interventions classification, a nursing intervention defined as minimizing apprehension, dread, foreboding, or uneasiness related to an unidentified source of anticipated danger. See also anxiety. bleeding reduction in the nursing interventions classification, a nursing intervention defined as the limitation of loss of blood volume during an episode of bleeding. bleeding reduction: antepartum uterus in the nursing interventions classification, a nursing intervention defined as limitation of the amount of blood loss from the pregnant uterus during the third trimester of pregnancy. bleeding reduction: gastrointestinal in the nursing interventions classification, a nursing intervention defined as limitation of the amount of blood loss from the upper and lower gastrointestinal tract and related complications. bleeding reduction: nasal in the nursing interventions classification, a nursing intervention defined as the limitation of blood loss from the nasal cavity. See also epistaxis. bleeding reduction: postpartum uterus in the nursing interventions classification, a nursing intervention defined as the limitation of blood loss from the postpartum uterus. bleeding reduction: wound in the nursing interventions classification, a nursing intervention defined as the limitation of the blood loss from a wound that may be a result of trauma, incisions, or placement of a tube or catheter. closed reduction the manipulative reduction of a fracture or dislocation without incision. flatulence reduction in the nursing interventions classification, a nursing intervention defined as the prevention of flatus formation and facilitation of the passage of excessive gas. See also flatulence. open reduction reduction of a fracture or dislocation after incision into the fracture site. a nursing intervention from the Nursing Interventions Classification (NIC) defined as limitation of the blood loss from a wound that may be a result of trauma, incisions, or placement of a tube or catheter. See also Nursing Interventions Classification.